Днес имах нужда от какао. От сладкиш с много шоколад и ядки. Исках кекс, но и суфле, а също десерт, чието приготвяне да не отнеме много време. Замислих се за браунис, после за фъдж, накрая се получи това - шоколадов сладкиш в чаша. Идеално! Направих по една чаша за мистър Д. и за мен. Беше готов за петнадесет минути! I needed cocoa today. I needed it in a rich chocolate cake with lots of nuts. I wanted a cake, but also a souffle and a dessert the preparation of which won't take too much time. 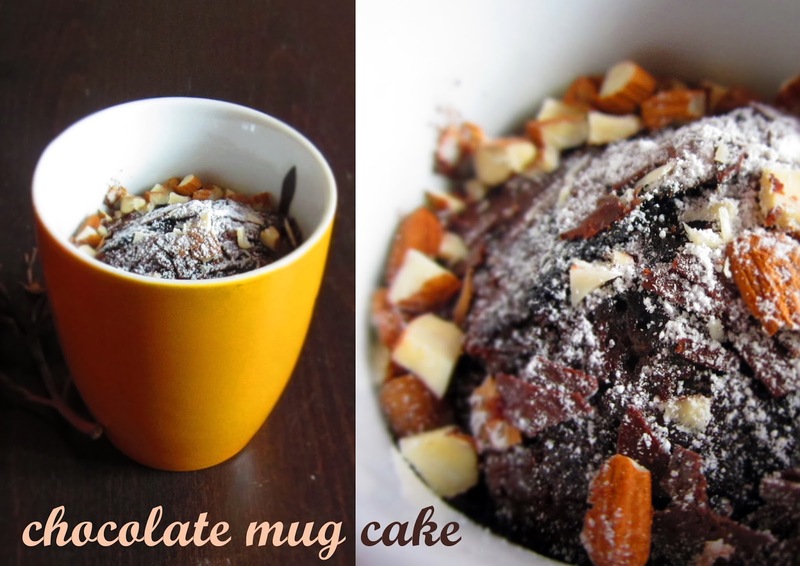 I thought about brownies, then fudge cake, finally I ended up with that - a chocolate cake in a mug. Perfect! I made a cup for Mr. D. and one for me. It was ready in fifteen minutes! Note: I used only four tablespoons of sugar, no coffee powder and instead of a microwave I backed it in a preheated (200°C) oven, for about ten minutes, then decorated with chopped almonds, chocolate chips and powdered sugar.